Marion, Iowa. Jan. 14 1924. The Cary Club met with Mrs. Brown. The President presided and responses to roll call were favorite verses from the Psalms. Minutes of the last meeting were read and approved. A brief report was given of the last meeting of the Federation. 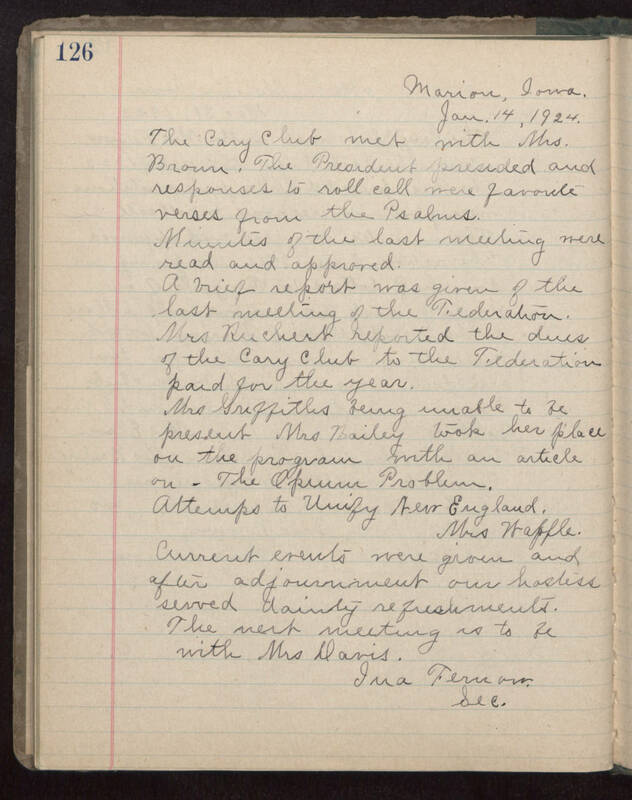 Mrs Riechert reported the dues of the Cary Club to the Federation paid for the year. Mrs Griffiths being unable to be present Mrs Bailey took her place on the program with an article on The [illegible] Problem. Attempts to Unify New England. Mrs [Waffle?]. Current events were given and after adjournment our hostess served dainty refreshments. The next meeting is to be with Mrs Davis. Ima Fernow. Sec.